Character: A collaboration between Dogfish Head & Sierra Nevada, using the best ingredients from both coasts. This is the second collaboration between two powerhouse breweries, Dogfish Head and Sierra Nevada. Their first beer together was called Life and Limb, and originally was released in 2009. 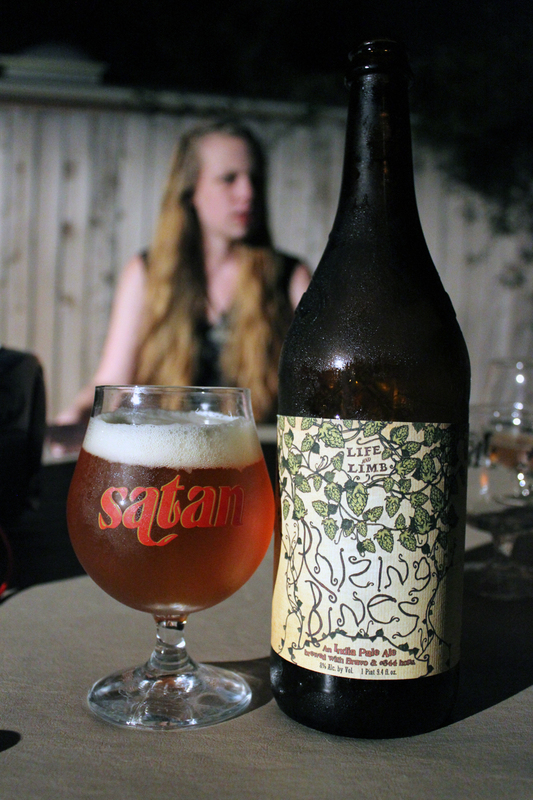 Unfortunately, I have not tried this beer yet, but I was able to get my hands on their send beer, Rhizing Bines. As Life and Limb was an American Strong Ale, Rhizing Bines is an American Double or Imperial IPA style beer. This East Coast/West Coast collaboration was skillfully thought out by these two breweries. This beer was brewed at the Dogfish Head brewery in Milton, Delaware, which went through DFH’s signature continual-hopping process with floral and citrusy Bravo hops. The beer was also dry-hopped with an experimental hop that is so new it doesn’t yet have a name, just a number: Hop 644. Pretty cool, huh? They used Sierra Nevada’s signature Torpedo System for the dry hopping. One other nice trick for this beer was that Dogfish Head celebrated Sierra Nevada’s new Brewing facility in North Carolina by using a soft red winter wheat grown and milled in nearby South Carolina. They each contributed their own yeast strains (Chico & Doggie) to this beer as well to further complex this beer. As I did not have the recommended “IPA Glass” at the time of drinking this beer, I used one of my favorite glasses, a Satan Red snifter. Rhizing Bines poured a bright hazy copper color with an inch thick frothy white head. The head retained throughout the session, which left sticky webs of nice lacing down the glass. As with most beers, after the chill haze disappeared, the beer cleared up nicely. The taste is unique and not a typical flavoring for an IPA. There was a heavy caramel body, followed by breadiness, which reminded me of crackers. I did pick up on a noticeable honey, buttery biscuit like flavor in mid swill. Complimenting all of this is the presence of the hops, which are a bit more subtle than I expected them to be. Hints of tropical fruit, citrus, floral, and an earthy taste are present but masked slightly by the malt, and yeast flavors. Maybe I should say all these flavors are more mixed and combined, rather than one over shining the other. They are all there, and with different tasting swills, each flavor shows up. Very interesting, indeed. The body was a medium thickness, good carbonation, not too bitter, and had a slick mouthfeel. It felt as if a slick coating was left on the tongue for a bit, but then it ended with a dryness on the tongue. Overall, I will have to say that the combinations of different hops, two yeast strains, and unique grains by these two awesome breweries made for an interesting beer. After reading about this beer, with the emphasis on the hops, I was really expecting more of a hop driven double IPA than what I actually got here. I knew it wasn’t going to be a Hop Bomb or anything, but I guess I just wanted this to be different. It was a great beer though, and I will love to drink this one again if brewed again. Metal Connection: I couldn’t wait to review this one, cause I knew exactly what song I wanted to use. The lyrics of this song seem to be about war, and fighting together as one against the enemy, and I completely see this song from a craft beer kind-of-way. In union we stand, as they blaze across the land, just as this beer did. I have always been a huge fan of the band Overkill, and I am happy to have this song paired such a good collaboration, and beer. “In Union we Stand” is from the band’s second full length album, Taking Over, which was released in 1987. Cheers!